If you think your dog understands your feelings, research shows you’re on to something. A study from the journal Learning & Behavior found that on average, dogs moved faster to open a door and reach their human when their human made crying noises than when they hummed “Twinkle, Twinkle Little Star.” So if your pup has some understanding of your mood, does your stress impact your dog? Scientific indicators point to yes. Think about the different ways you show stress: tone, facial expressions, words, and behaviors. Your dog reads those cues, perhaps even better than some of the humans in your life because your dog pays you so much attention. 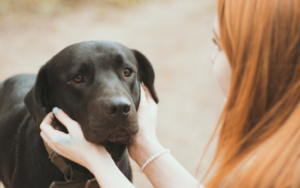 You understand that your dog recognizes your feelings, but there is more to the story than that. There’s a science behind the relationship between your emotions and your dog’s reactions. Let’s dig in. Imagine this scenario: your partner returns home from work. You ask them about their day and they tersely respond, “Fine.” What does that make you think? Do you hear the underlying subtext that their day was most certainly not fine? Your pup has an idea. Dogs recognize inflections in your voice and even have some biological reactions to them. 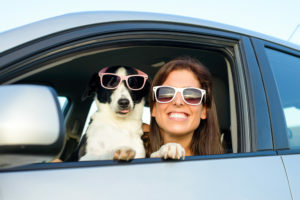 A study from Scientific Results looked at a dog’s response to human emotional vocalizations. The researchers found that different hemispheres of the dog’s brains reacted depending on the tone. When a dog heard a voice with negative emotions (like unhappiness or fear), the right hemisphere of their brain responded. When a dog heard a voice with upbeat emotions (happiness), the left hemisphere of their brain responded. Furthermore, the research found that dog’s cardiac activity (think: heart rate) was affected by the tone humans used when talking to them. If you say to your dog, “I’m very stressed out because there’s a big deadline at work,” he won’t understand the words. But he will notice if your voice shows signs of stress and unhappiness. Let’s return to our imaginary scenario. When your partner returns home from work with a hangdog expression, you almost don’t need to ask them how their day went. The facial expression tells the story without words. It turns out dogs not only recognize what the sound of your voice means, but they also understand how visuals relate to emotion. This is pretty fascinating stuff because only primates were thought to have cognitive abilities. And even more interesting, Huber’s research demonstrated that an animal other than humans can differentiate between emotions in another species. When stress is translating to your physical appearance, your dog can see it. Let’s revisit our scenario one last time. Your partner comes home from work downcast, dragging their feet and speaking with little enthusiasm. Do you know how they will behave? Will they want solitude? Will they skip dinner? You can probably deduce what they will do next based on previous experiences. Your dog can do that, too. In the research, it took dogs longer to learn that a person with an unhappy face would give them a treat, indicating that they had an idea of what an angry face meant: fewer rewards. And on the reverse side, the dogs learned more quickly that a person with a smiling face indicated a reward was more likely. You adore your dog and don’t show him an angry face often. But in the event that you did, your dog may learn that when you are angry, they should give you space because you are less likely to give them extra treats. We’ve told you about ways you can unintentionally cause canine stress and unfortunately, it’s true that your stress also impacts your dog. So if you want to cause your pup less angst, think before you speak. If you’re stressed, don’t attempt to engage your pup in training exercises or other commands. 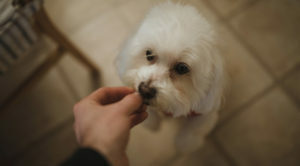 And if you’re exhibiting signs of stress, give your pup a treat, so they know you still love them. But remember, if you have a pup at home you’re actually helping yourself relax. One study found people with pets and high blood pressure could keep pressure levels lower during times of stress than patients without pets. Don’t worry if you occasionally cause your pup stress. Sometimes it’s unavoidable. But now you know to be mindful of these behaviors. If you notice your dog is reflecting some of your unhappy energy, take a walk together and let some of the stress melt away.